Bonnie has definitely found a nice napping spot in this studio. Submitted by David Lemur via our Facebook page. Bonnie says: ‘More of John Cage’s 4 minutes and 33 seconds of silence please Donny’. We see an Arturia Keystep, Roland TR-8, a TB-303 clone, a vintage Korg sequencer, and even a bit of Buchla in the upper-left corner. Most of the modular is obscured by this cutie, but we do espy a pair of KOMA Field Kits, as well as a Buchla Music Easel. This past weekend, April 22 and 23, a series of concerts and panels took place at the Gray Area Foundation for the Arts in San Francisco. It was in the midst of a busy and event-packed weekend (including the March for Science which we have already written about), but as Don Buchla was someone that I not only admired but knew personally, it was important to be there. Buchla lives on though his many innovative musical instruments, and a pop-up museum was set up in side room of the theater showcasing many of them. On the right of this photo is an example of Buchla’s iconic 200 series modular synthesizer, probably the instrument for which he is best known. On the left is the rarer 100 series, originally commissioned by electronic-music pioneers Ramon Sender and Morton Subotnick of the San Francisco Tape Music Center. Neither the of these early modular series had a traditional piano-style keyboard, nor were they based traditional subtractive-synthesis architecture of oscillators, filters, and amplifiers in that order, but rather a mix of traditional synth modules with unique waveshapers, low-pass gates. The latter is probably the most recognizable as the “Bucha sound” but the variety of musical sound expression from this instruments continues to be very wide and the ethos of his work can be seen in the current renaissance of sometimes esoteric modular synthesizers. You can read more about his work and philosophy on this tribute website. There were also some instruments I had not seen before, including the Buchla Touché and the 700 series / MIDAS. These were more conventional in the sense of having a keyboard and a more fixed topology, but were still quite versatile in terms of their software. They certainly have a very vintage 1980s look, especially with the computer monitors and graphics. The evening concert began with tape pieces by George Lewis and a premier of a new piece by Laurie Spiegel. Spiegel’s piece had a dark but sparse quality, with discretely positioned sounds and timbres. The live performances began with Laetitia Sonami performing on a custom gestural controller. Her work is often focused on live movement and gesture and indeed has been an influence on my own performance practice with the theremin. But Sonami is adept at very subtle motion with seemly precise affects on the sound output. The live performances continued with Bob Ostertag, who controlled live music and video from the center of the hall. Ostertag’s sound is quite distinctive independent of the particular instruments in use, usually noisy and hard driving. And this performance was no exception – indeed, I was able to instantly recognize the sound as his when it started, even without being able to see him at first in the darkened space. The music however, did have dynamic range and timbral variation that gave it a narrative contour. The video was abstract, but again with a bit of an urgent quality that kept things moving forward. Morton Subotnik’s music is in many way the opposite of Bob Ostertag’s. It is quiet and very subtle, focused on small points and details in time. It was spare, almost severe, but listening closely one can appreciate many of the timbral details. The changes are musical but on a different scale than one is accustomed to. The frequencies timbres are complex even while the amplitudes are low, and it is listening to these and the slight percussive elements that punctuate the music that one begins to hear how it fits together. In between the live performances there was a tribute video for Don Buchla, featuring images as well as interviews with him. There were also cameos by a great many people I know in the electronic-music world. It was very touching, but also quite humorous, all in keeping with Don’s character. The concert continued until late at night – in some ways, it was set up more likely a crowded nightclub or impromptu electronic-music party than a traditional concert. It was great to see it so well attended – the room was packed with people standing or sitting on the floor, but it did make focused listening a bit of a challenge at times. I was unfortunately not able to stay for the whole night, so missed a few live sets, including from friends Marielle V. Jakobsons, Tom Dimuzio, Matt Ingalls, and Richard Devine. I do hope to see them live again soon. I also hope this is not the last event we have to celebrate the life and work of Don Buchla. I personally still feel like I have only scratched the surface of his instruments as a performer and listener. 2016 has not been a good year for our musical heroes. And we have just lost one more, Don Buchla. Don Buchla was producing his first synthesizers about the same time that Robert Moog released his earliest models. But he took a very different approach, eschewing keyboards and other traditional interfaces to make a truly radical instrument. This led to some describing “East Coast” and “West Coast” schools of synthesizers – something that we at CatSynth largely reject. But there are nonetheless characteristics that set apart Bucvla’s instruments, such as the use of metal plates as controls; the ubiquitous use of low pass gates (LPGs) as sound units; the crispier/crunchier sound compared to Moog-inspired synths; and the visual beauty and oddness of the instruments. 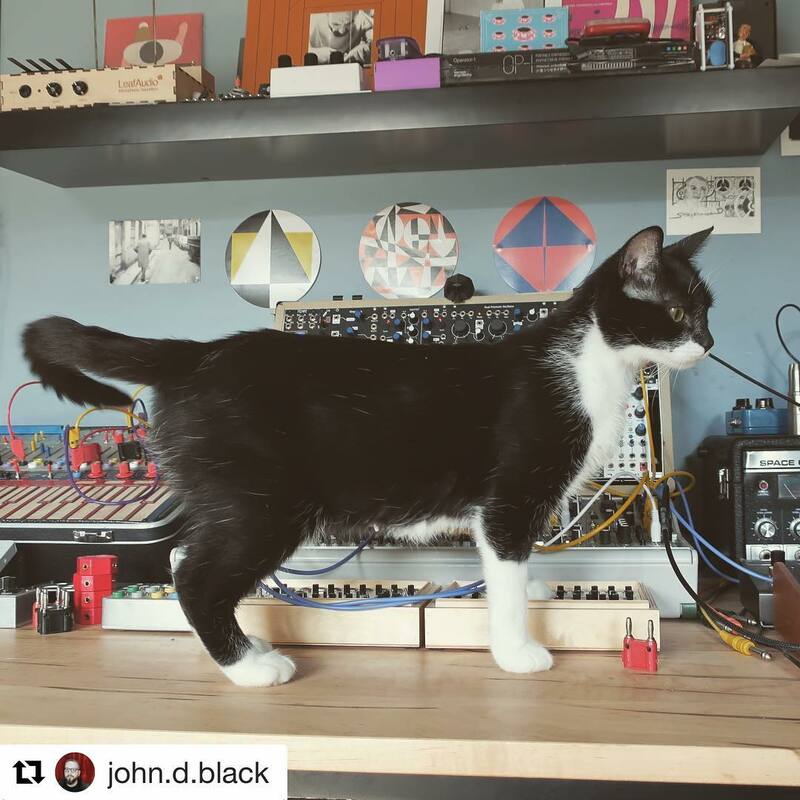 Indeed, they have appeared on CatSynth many times – follow this link to see a few. In addition to his synthesizers, Buchla also created numerous controllers, such as the Thunder, Lightning, and Marimba Lumina. Indeed, I was introduced to Buchla’s instruments and the man himself through David Wessel at CNMAT, who used the Thunder extensively in his performances. My personal memories of the two of them together mostly revolve around the wine-and-beer-fueled gatherings after formal events at CNMAT, ICMC conferences or elsewhere. They would talk endlessly but anyone else could chime in, and occasionally Don and I would have a sidebar, less often of a technical nature than lamenting strictures in one institution or another, or non-musical scientific concepts. Overall, however, he was often a laconic presence, off in a corner or just off frame, but then fully engaged when the moment arrived. 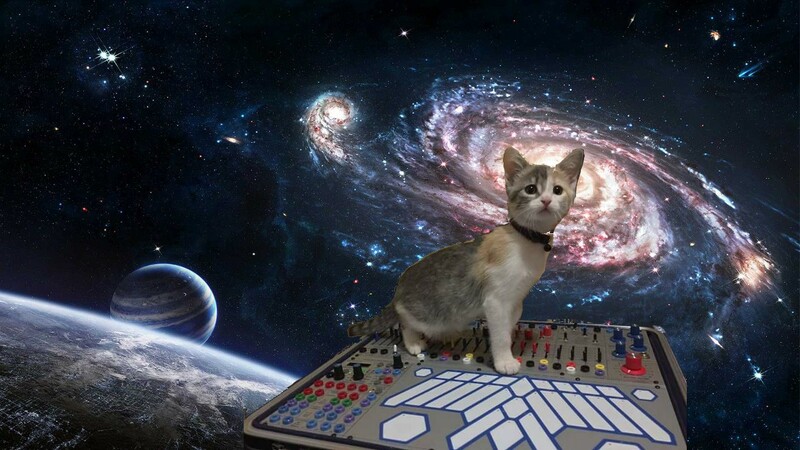 Cat surfing through space on a Buchla synthesizer. From Cats on Synthesizers in Space. Buchla synths are weird. That is of course the charm. They are also known for being quite expensive. The LEM systems and h-series modules from Buchla Electronic Music continue to push lower in price, including this self-contained LEM4 system with “Music Easel-style” keyboard. It contains a Buchla dual complex oscillator, vactrol low-pass filters/gates, and MIDI and CV options. The combination contains what one needs to make distinctive Buchla sounds with the crunchy high-pitched oscillators, and of course the percussing low-pass gates in odd rhythms. At $2499, however, it is still quite pricey for an entry-level unit. Another way to get started with Buchla modules would be use one of the adapters that allow Eurorack modules to be embedded in an e-Series system. While billed as “the solution to fit that ‘must have’ Eurorack module in your 200e or LEM system”, it would allow one to combine a Buchla oscillator or gate with an existing Eurorack system. Something that is certainly an intriguing possibility (a delightfully dangerous one). And for sheer aesthetics, the 252e Polyphonic Rhythm Generator still remains my favorite. Submitted by Donny Lemur via our Facebook page. You can find our previous articles and pictures featuring Buchla synths here. From grayemoon on Instagram. Cool Buchla system, but this has to be among the weirdest “CatSynth pics” we have posted yet. Buchla introduced several new instruments and add-ons this year, including an entirely new modular series, the 200h. The 200h aims to be a more compact (and hopefully lower cost) series of modules, but the same esoteric sound and control that make Buchla instruments infamous. They have been assembled into “mini-systems” including the LEM3 Spider shown below. That colorful circular thing is actually a 200e series, specifically a 252e polyphonic rhythm generator. It is visually gorgeous! Here is a short video of my attempts to play the LEMs. 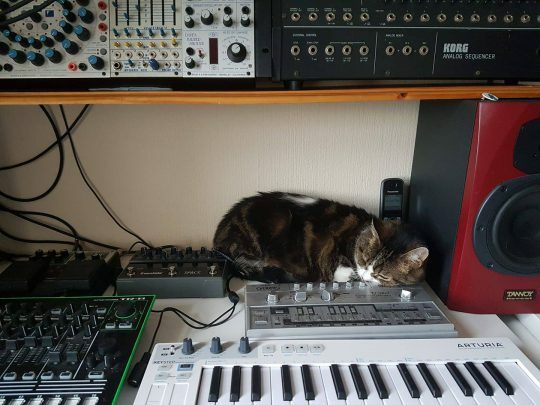 From muff’s forum, where cats often lurk amongst the synth posts.